Image caption Satnam Singh Blugher lived at the cafe where he died. 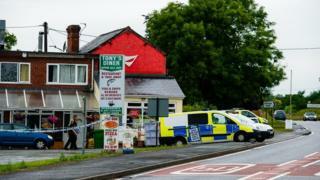 A man has been charged with murder after a man was found dead at a roadside cafe. The victim, Satnam Singh Blugher, 67, was found dead with serious head and torso injuries on 26 June at Tony's Diner, Halfway House, where he lived. Belkar Singh, 58, from Halfway House, which is on the main road between Shrewsbury and Welshpool, has been charged with his murder. He will appear at Telford Magistrates Court later.